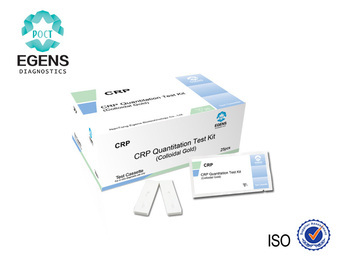 C Reactive Protein (CRP) Quantization Test Kit (Colloidal Gold) adopts double antibody sandwich method principle and immunochromatography gold labeling technique to rapidly determine C reactive protein (CRP) in human serum, polyester fiber (or non-woven fabrics) is pre-peridium with gold labeling CRP monoclonal antibody and rat monoclonal antibody, nitrocellulose membrane detection line and quality control line are peridium separately with CRP monoclonal antibody and anti-rat IgG antibody. During determination, serum specimen is dropped within sampling-adding area of test paper, then mixture chromatography upwards because of capillary effect. If concentration of CRP in specimen is more than 0.5ug/ml, colloidal gold firstly combines with CRP antigen in specimen to form compound during chromatography process and then the compound move forwards along strip because of chromatography effect, the compound combines with pre- peridium CRP monoclonal antibody to form sandwich of “Au-CRP Ab- CRP Ag- CRP Ab” when it passes detection line, so detection line will show amaranth strip; the deeper the color of detection line, the bigger concentration of CRP in specimen. Dissociated gold rat monoclonal antibody is combined with anti-rat IgG antibody at quality control line which will show amaranth strip, this strip is the standard to judge whether sampling adding amount is accurate or not and chromatography is normal or not. Different batches of product calibration card includes standard curve information of product for corresponding batches, it is inspected in detector after adding sampling, signal is captured by collecting gray value of detection line; detector automatically compares and analyzes gray value with standard curve and you can get CRP content in specimen. It is composed of test paper strip, plastic card, drying agent and aluminum foil bag while test paper strip is constituted by plastic substrate, colloidal gold pad, cellulose membrane, sampling adding pad and absorption pad. Colloidal gold pad is pre-peridium with gold labeling CRP monoclonal antibody and rat monoclonal antibody, nitrocellulose membrane detection line and quality control line are peridium separately with CRP monoclonal antibody and anti-rat IgG antibody. 2-30℃ and keep in dark and dry place for storage. Validity period of this product is 12 months since production date. It can be kept for 1 hour in humidity of under 65% after unsealing and it should be used immediately after unsealing if humidity is above 65%. 2. Fresh specimen should be used during inspection. Specimen can be stored at 2-8℃ for 7 days and at -20℃ for long term cryopreservation if the specimen can’t be inspected in time. 3. Specimen should be recovered to room temperature before inspection; specimen stored in cryopreservation should be completely melted, re-warming and mixing evenly before using. You must read whole instructions for this product and GICA Test Strip Intelligent Detector completely before testing. 1. Get Specimen for testing from storage condition, balance it to room temperature and give number to it. 10-25μg/ml is possible virus infection, >25μg/ml is possible bacteria infection. 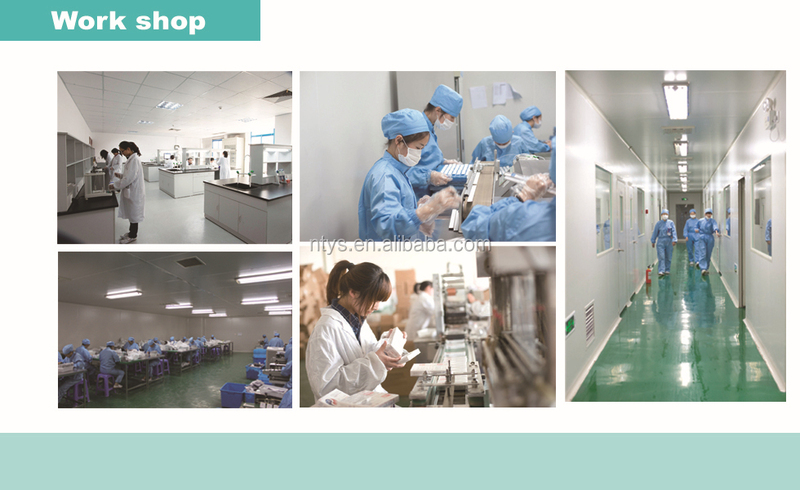 Some antibody which has some composition of kit may affect testing result and it should be judged together with patient’s medical history and other laboratory reports, this kit just provides auxiliary diagnosis. Clinic definite diagnosis should be made comprehensively by professionals with consideration of clinical symptoms and auxiliary tests. 4. Specimen of bilirubin (30mg/dl) and triglyceride concentration(1000mg/dl)are tested, phenomenon of cross reaction has not been found yet and testing result of this reagent is not affected. But hemolysis specimen has interference with test result and should be avoided. 1. This test paper card can only be used for in vitro diagnosis testing. 2. 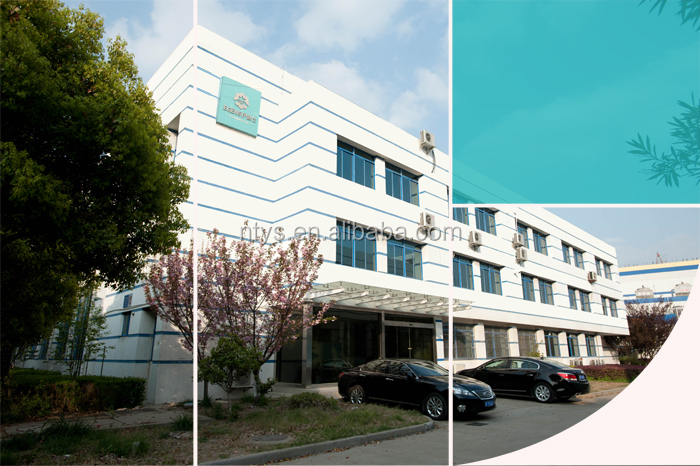 Testing environment can’t be in too high temperature, too high humidity or too dry. 3. Unsealed testing paper strip or card should be tested as soon as possible and can’t stay in air for too long time to avoid invalidation because of damp. Please don’t use it if inner packing is broken. 5. Operation should be done the same as inspection regulations of infectious disease laboratory. 6. Please do labeling working to avoid confusion when a lot of specimens are tested. 7. This test paper card is only for one-time in vitro diagnosis testing and can’t be reused after using. Don’t freeze it or use out of validity period.